In the Netherlands, mobile payments using HCE are becoming ubiquitous. Other European countries, such as Belgium, France or Germany follow the same trend, with adoption rate reaching in some cases 40% yearly increase. One of the key elements causing this shift was the introduction of Host Card Emulation (HCE) technology in Android based phones along with adoption of common specification framework by EMVco on tokenization – writes Cezara Ceobanu, Product Marketing Manager at equensWorldline SE. What is it and why should banks use it to strengthen the customer relationship? The big majority of previous mobile payment concepts have failed to reach traction because of lack of acceptance infrastructure, high deployment costs or way too complex business cases. The introduction of HCE and the concept of tokenized EMV payment data can be seen as a real breakthrough for mobile payments, because it allows the usage of existing acceptance infrastructure for contactless cards while preserving secure payments without the need of mobile data connection. This has reduced significantly the complexity of the payments eco-system and assured unified, global reach, making mobile payments a real alternative to cards and cash. Banks are now given a real opportunity to secure their presence in the new, digital life of their customers by offering their own solution for customers with Android based phones (Kitkat 4.4 and up) or by facilitating card enrolling in phones using iOS systems. Users can safely activate the service within minutes, just the time one needs to queue in line for a purchase. After initial strong authentication in the mobile bank environment, the scanned cards are virtually emulated in the mobile application and ready to be used for shopping. The protection of credentials within the app is ensured by the usage of tokenized data which allows the real data to be replaced by surrogate one with limited availability in time, number of usages and channels. 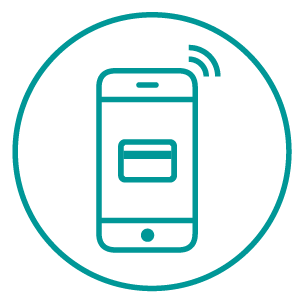 The HCE technology is bridging the communication between the transit, access or payments mobile app and a contactless terminal via Near Field Communication (NFC) transfer. Prior to the HCE architecture, NFC transactions were mainly carried out using secure elements, which made it difficult to scale the mobile payments. equensWorldline was one of the early adopters of HCE technology and the initial interest that sparked was proven to be worth it, with prototypes and pilots emerging in almost all geographies. We are now in the middle of massive deployments and adoption, which proves once more that the concept was an important milestone in the mobile payment developments. Although three years is a relatively short amount of time in the complex world of payments, the road was not always easy or fast as solution need it to be adapted and integrated into existing core processes and systems of the banks. That could be challenging, because small and medium banks lack resources to invest in a new technology like this. We understand these challenges, but we are there to help because we see a clear trend towards mobile payments in the industry. The next step to reach full adoption is to create habit by adding additional layer of services. Deploying token-based solutions is only a first step towards a fully digitalized payment app. Banks now need to increase the quality of mobile payments experience through additional payment choices and services. Unlike the plastic card, the smartphone is an ideal tool for this, as it tracks consumers, pushes promotions, processes digital receipts and reports on spending. Mobile payments are therefore just one, but very important piece of the entire digital banking experience. There are several white label solutions available to implement and bring it faster to the market, but it is important to offer these mobile payments in a familiar environment, such as the banking app, without the necessity to remember and manage additional login data. In our opinion, isolated solutions will not prevail. Providing individual setting options to users can further increase the complexity of the implementation. It is therefore important for banks to work with suppliers like equensWorldline that can customize and give the differentiating edge for their solution. The result will be an easy to use mobile payment solution, which will strengthen the relationship with their users. In a few years’ time, mobile payment with a smartphone will be part of our everyday life, just like cards are today. The introduction of mobile payments can certainly be compared to the introduction of contactless payments: once the customer has used it and experienced the advantages, he will use it again. In the end, solutions that create best experiences for each specific life event and can be used anywhere, will prevail.